The late data and alarming updates from The Department of Child Safety received an unfavorable reception at a recent Joint Legislative Budget Committee meeting. DCS officials finally provided some of the information they are obligated to report, but Governor Ducey’s handpicked agency director, Greg McKay, didn’t bother to attend. Maybe it was because the report was not only nearly three months late but it also showed that things are getting #WorseNotBetter for the crisis-stricken DCS. Caseworker staffing levels continue to drop, while the backlog continues to grow. The agency now has even fewer case-carrying caseworkers than it did in September of this year. The number slid from 972 to 930, which is a far cry from the 995 case-carrying caseworkers in the agency had in May 2014. Governor Ducey has failed to show leadership on this issue since he took office. Ducey appointed McKay to head DCS but did not allow legislators to fully vet his qualifications. Ducey’s DCS leadership team also included a deputy director who quit after four months, and an expensive business consultant who left the agency last month without leaving any clear evidence of his work. Director McKay missing his own agency’s review committee is just the latest grievance. Arizona’s children will not be better off until the governor takes real responsibility. Some are beginning to question how long the governor can continue to support his appointee. 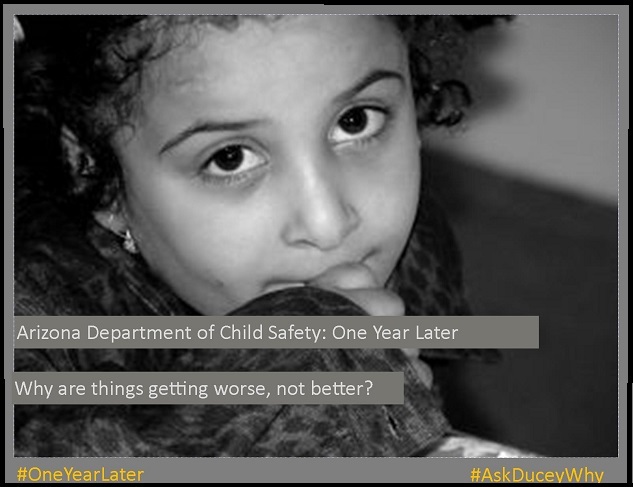 #AskDuceyWhy he is not holding the agency director he selected accountable for the thousands of Arizona kids who may be in jeopardy. The Department of Child Safety officials are late – again. This time they are three months late in releasing quarterly reports on performance measures including current child abuse and neglect investigations and staff retention. This is part of an ongoing issue with the agency, which is routinely late sharing its data. Previous reports from DCS indicate the agency is still in crisis. In light of this and Director McKay’s admission that some of the agency’s money was “not well spent,” it seems increasingly unlikely that the delayed reports will show a reverse in the increasing backlog, troubles retaining caseworkers and growing need for additional foster homes. The trends still appear to be moving in the wrong direction, and delays in reporting are making it increasingly difficult to correct the problems plaguing this agency. The information that DCS Director McKay has shared is alarming. We need accountability from DCS and the governor. 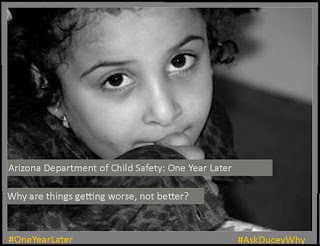 #AskDuceyWhy he has no plan to prevent the immoral neglect of Arizona’s vulnerable children. 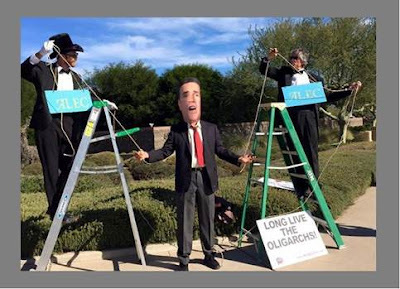 Governor Doug Ducey reportedly got a “hero’s welcome” as the keynote speaker at a national meeting of the American Legislative Exchange Council (ALEC) - a group with a reputation for brokering behind-closed-doors deals with state legislators to influence local policies. The governor’s involvement with this organization could create a dicey future for our state. He has congratulated himself for begrudgingly returning only about 70 percent of the inflation funding Republicans swiped from public schools over several years (and only after a court ordered the state to pay schools back). And that doesn’t even begin to come close to restoring the billions of dollars in other funding cuts schools have had to weather. But ALEC has strong ties to the Koch brothers, who also provide funding for several groups that support draining resources from public schools. The governor brought in the Goldwater Institute and the Reason Foundation as two key consultants to his Classrooms First Initiative Council to work on major education changes. Both of these organizations support policies that hurt the state’s public schools and both have ties to the Koch brothers (for more info click here and here). A key objective of the Reason Foundation is to privatize schools. And the Goldwater Institute champions voucher programs, calling them empowerment scholarship accounts and student tuition organizations, which siphon money out of the state’s general fund that could and should be going to support our public schools. With this level of cronyism and agenda pushing, public schools should brace for what the future holds. It seems that he is more interested in grabbing headlines and aligning his priorities with the priorities of special interest groups than in the moving the state forward. The governor should not be able to claim credit for returning money illegally swept from public schools. And he should be held accountable for his associations with groups that have a clear agenda designed to undermine public education in Arizona. #AskDuceyWhy he is surrounding himself with Koch brother cronies. STATE CAPITOL, PHOENIX – Rep. Mark Cardenas, D-Phoenix (District 19), Rep. Diego Espinoza, D-Tolleson (District 19), Sen. Lupe Contreras, D-Avondale (District 19), and Avondale Mayor Kenn Weise are partnering with the Arizona Game and Fish Department to host a free fishing clinic at Friendship Park in Avondale. The Arizona Game and Fish Department will waive fishing license fees for the clinic and will provide rods and reels for use at the event. 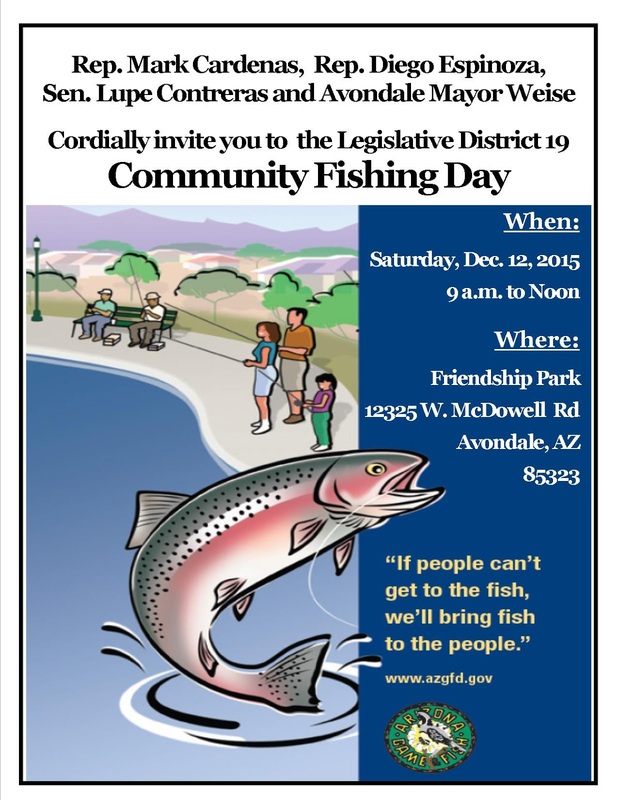 For more information, contact the office of Rep. Mark Cardenas at 602-926-3014.